Those who follow me on Facebook (here) will recognize this pond and view which is down the driveway and onto Ludwig Road, between two neighbors’ houses. 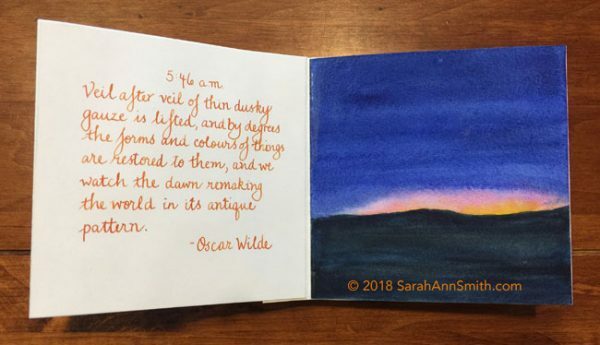 Recently, I’ve been taking some journaling and watercolor classes. Then, the Mid Coast (Maine) Book Arts group had an exhibit at the Camden Public Library. I was inspired by a book of hours on display, so BFF Kathy D. and I decided to make our own small accordion books. Below the still photo you’ll see my a video tour of the book, which I have titled “moments hours days autumn” to chronicle my life this past Autumn. Beginning at 3:11 a.m. through to my evening ritual of sitting in my chair near my hubby’s chair, with the dog and a pile of books. 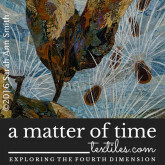 You can see still shots of each page in my new Mixed Media gallery. The left page is a quote, some by me, most by someone else. The right page is a watercolor, 5 x 5 inches. I figured I would mess things up, so it was better to do each separately, then glue them to the accordion “base” pages. On the back, I painted a single LONG (80 inches!) view that runs from winter to spring, summer and fall, back to winter, with the sky running from night, through morning, noon and afternoon, back to night. I used a dip pen and acrylic ink to write Strider’s Poem, by J.R.R. Tolkien, which has been a favorite since high school and whose meaning goes far beyond the Lord of the Rings saga. I used Daniel Smith Watercolors, Stonehenge Aqua 140 lb. 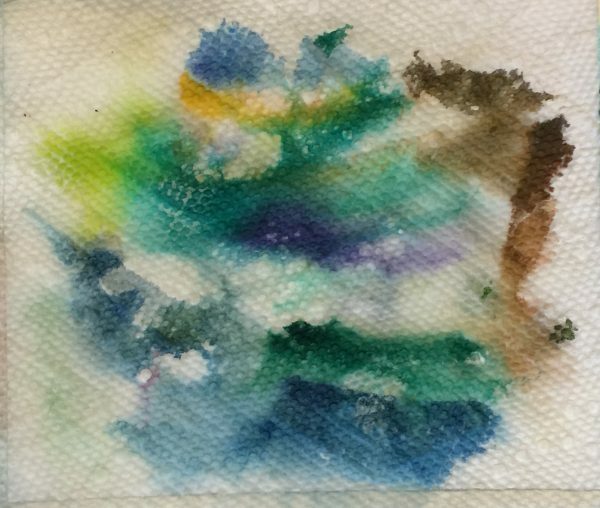 watercolor paper, Yes! paste glue, and both acrylic and fountain pen inks and a dip pen for all the lettering. 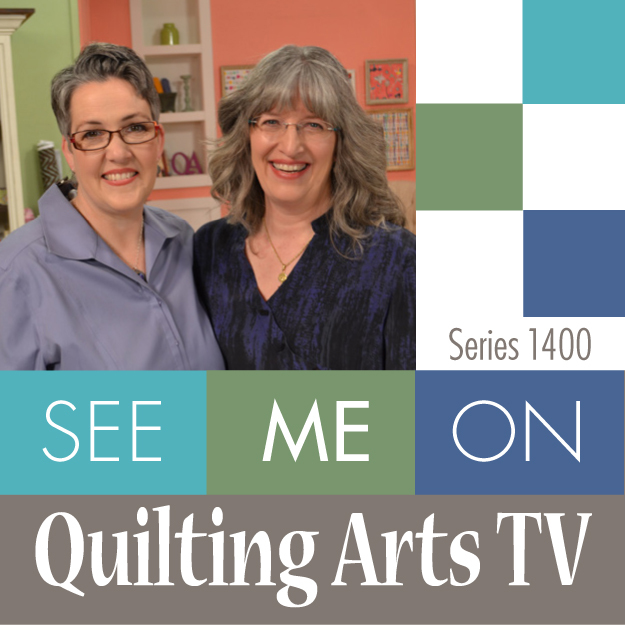 The cover is made from my own hand-dyed fabric fused to mat-board from Kathy with Mistyfuse. Here’s to hoping you all have friends (which can include family!) and joy around you throughout your lives, not just this season. I hope you enjoy my first ever made-by-me book. I think I will do more! 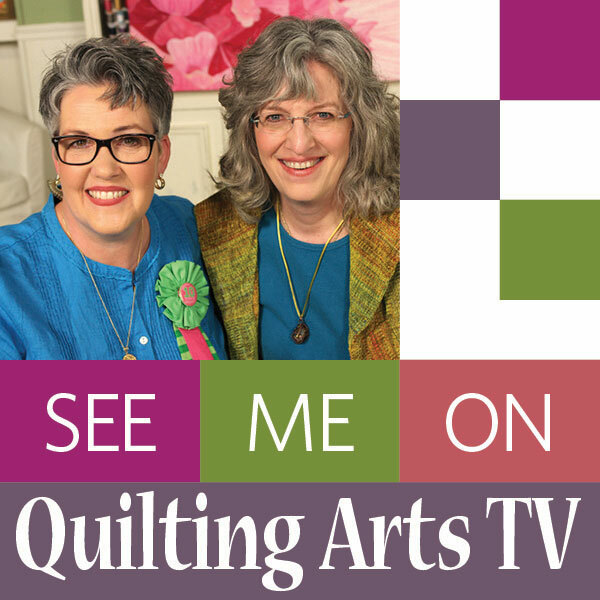 Let me know what you think, and what you’d like to see in my new Newsletter. (And to sound like a broken record, sorry, sign up here.) MERRY MISTLETOE! You know you’re tetched in the head (old phrase from my mother and aunts, meaning a few bricks short of a full load a.k.a. crazy) when you like your paper towel swipes LOL! I’ve signed up and am actually doing the lessons in a couple of online classes: Journey Through the Natural Year with Val Webb and SketchbookSkool’s Watercolor Rules (are made to be broken). So I’ve been playing. Wiping my brush off may be one of my best watercolors to date LOL! 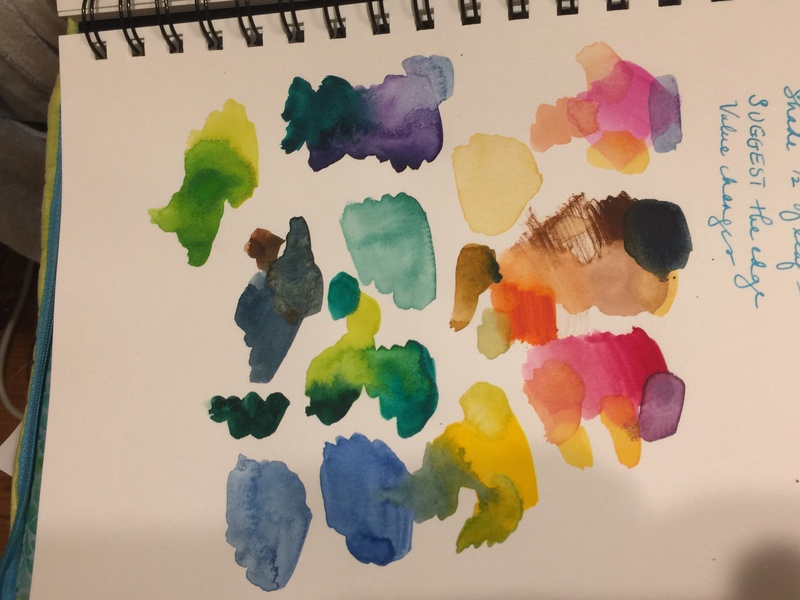 I’ll share some of my exercises as the classes go on, but I wanted to share this tiny palette I found at least a year ago but haven’t used. I bought it solely for the tin–the Schminke ones cost a fortune. This one may not be quite as sturdy, but it is mighty nice! This little black palette has a ring on the bottom to help hold it if you are sketching in the field. The center portion lifts out (it’s between the box and the tin in this photo) for more mixing area. 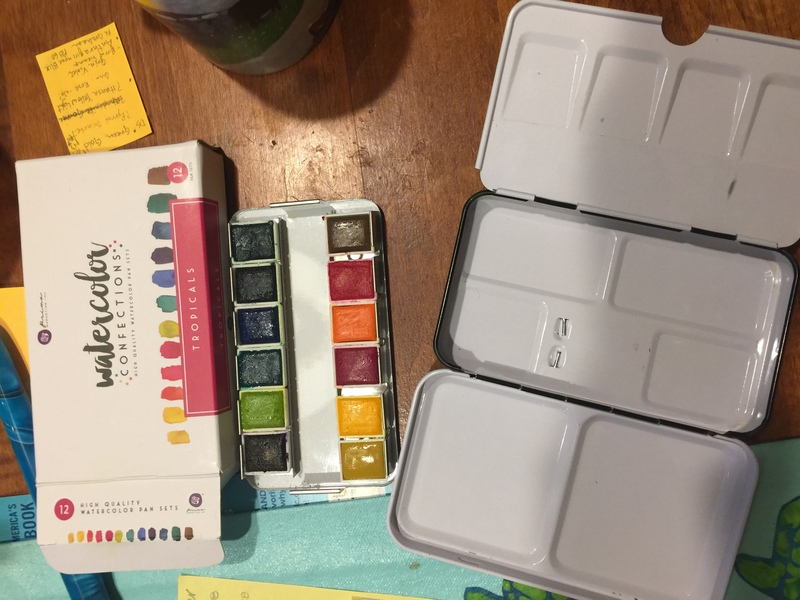 I am pretty sure these are standard half-pans so could swap them out for higher end watercolors (or just empty these and re-use). The item is still available on Amazon for about $19, here. There are other colorways but I liked this one and it was cheapest. Closed it is just under 3 x 5 inches! Here’s a paintout of the colors. The quality of the colors is better than I expected. Definitely not Daniel Smith or M. Graham, but adequate for a quick color in a sketchbook. But as I said, I bought this for the tin, not the paints.